Today, printers have become an indispensable part of computers considering the huge amount of printing works that are being done at offices and even at homes. HP and Canon are two trusted names in the market for offering an array of printers that suit every specific purpose. 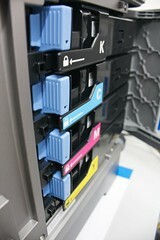 Installing a printer and making it ready for use is not a difficult task. It normally depends on its specific purpose i.e. office or home use. Hereafter in the article, printer for home use will be referred to as local printer and the office one as network printer. The operating system in use is Windows 7 Ultimate. They can be followed for Windows Vista too. For XP, it may have to be done in a bit different manner. • Now install the driver following the on-screen instructions. Upon its completion, it asks to plug in the USB cable to its respective port. It then automatically detects the printer. • An on-page instruction will appear that asks to print a sample page. Once this is done, the installation can be finished. The printer is ready to print now. A network printer allows many users to share a single printer thereby nullifying the extra costs of procuring many printers. For its installation, the first thing to be made sure is to get it installed on a main workstation, post which it can be shared with other PC/laptops. Following are the steps to get the printer working on the network of computers. These are the basic steps that are involved in installing a local printer as well as a network printer. Should one have a fair knowledge of PCs/Laptops, it should not be a difficulty to get these steps right. For any kind of technical issues, one should not be hesitated to seek expert advices from the technical support team of the printer manufacturer. Padameshwar Singh Nongthombam is a prolific blogger. In this tutorial we will learn how to install a network printer in Win7. http://www.petenetlive.com/KB/Article/0000624.htm – Windows 7 Connecting to an IP Network Printer.